This is a missing post from January 2015! Our reunion weekend by all accounts was a resounding success. It was wonderful to meet you all and share your memories of the family. Certainly it was worth every bit of the hard work put in by the reunion committee and we thank you for your enthusiastic attendance. We had more than 120 attend on Saturday and over 60 on Sunday for a delicious lunch. The age range was 10 month old Amy Rose Hooper -to our oldest attendee Rhys Runciman aged 98! The hours flew by on Saturday as we all chatted with each other. I know many commented they would have loved longer to chat and it was great we had scheduled the Sunday lunch. On Sunday we were entertained during lunch with talks about various branches of the family and we would love to thank all those who contributed and shared their memories . It seems that a wonderful time was had by all making the hard work of the reunion committee well worth all the effort . To download any photo click on it and it will open in a new screen with a download button at the bottom right of the page. Many books orders have been placed and some of you have already received your books. Walter Farrer Middlebrook was the youngest of the 12 chidren of John and Mary Ann Middlebrook. He was born in 1899 only a few years before the family made the move from Auckland to Te Awamutu . He followed his brothers lead by working as a butcher in the store owned by is father John. It appears that Walter may have been quite the ladies man, and this unfortunately lead to his demise at the young age of 34. The events leading up to Walter’s death are best described by a newspaper report in the Auckland Star on 28th February 1933 which reported on the judgement of the coroner. A verdict that death was caused by a gunshot wound, self-inflicted, while suffering from strong, mental strain, disposed of the possibility of murder or accident in the caee of Walter Farrer Middlebrook, aged 33 years, butcher, of Te Awamutu, whose body was found on a vacant section on Monday, January 23, under circumstances which at first suggested the possibility of foul play. The inquiry was held before the coroner, Mr. G. A. Simpson, J.P. Detective-Sergeant J. Thompson represented the police and Mr. C. G. Downes appeared for the relatives. Ernest Joseph Ramsbottom, married, of Te Awamutu, said he was a fruiterer and confectioner by occupation and his shop adjoined that of Middle brook. He had known the latter, who was employed in hie father's butchery business, about 10 years. For about six months prior to his death Middlebrook occupied a room at the back of the washhouse in the back yard. At 5.45 p.m. on Saturday, January 21, he invited witness to go to the hotel for a drink. They had two medium beers each and deceased had tea with him. Witness then drove a friend home, leaving the deceased in his house with his wife and children. On returning home, witness looked through the kitchen window and saw Middlebrook grasp his wife and kiss her. "I went into the kitchen," witness continued, "and the deceased went to his room. I was naturally very angry about this and spoke to my wife and the deceased. Middlebrook said: 'I'm guilty, Joe, it's my fault.' That night Middlebrook went to the pictures. About midnight I closed the shop and then had an argument with my wife over the kissing incident. I was worrying and brooding over the matter and I told my wife she would have to come with me and have it out with Middlebrook.."I went into the kitchen," witness continued, "and the deceased went to hie room. I was naturally very angry about this and spoke to my wife and the deceased. Middlebrook said: 'I'm guilty, Joe, it's my fault.' That night Middlebrook went to the pictures. About midnight I closed the shop and then had an argument with my wife over the kissing incident. I was worrying and brooding over the matter and I told my wife she would have to come with me and have it out with Middlebrook. So I went to his room in a rage, and swore at him. There was a struggle and my wife fell over a bucket there. He kept telling me he was guilty and that it was all his fault. I hit him on the chest with my fist and Middlebrook returned to his room. There were further words between my wife and me." Mr. Thompson: I believe you cleaned up everything in the place with the axe?— Yes, I smashed up the room. You took several bottles from your shop and smashed them there? —Yes, I hurled them at the pictures. You threw eggs about? —Yes. Running With Firearm. Albert James Westbury, night porter employed at the Te Awanlutu Hotel, deposed that while working in the commercial room at 1.45 a.m. on January 22 he heard a door bang. On going outside he heard a noise at the back of Middlebrook's shop and a voice calling, "Open the door!" He then saw Middlebrook run in his pyjamas with bare feet. He was carrying a firearm. Witness cried: "What's all the row about, Walter?" Middlebrook replied that everything was all right and ran on down Palmer Street towards the paddock where his dead body was found. Dr. F. C. Blundell, of Te Awamutu, said he inspected the body after it was found. There was a rifle in the left hand and the face was covered with blood. The rifle was lying across the body at an angle of about 45 degrees. Death had occurred about 36 hours previously. At the post-mortem examination the bulletwound was observed between the right ear and the eye. It was clear that the shot had been fired at a close range. To Mr. Downes, witness discounted any possibility of death being due to accident owing to the position of the body and the bullet. From his knowledge of the deceased over 14 years he did not regard him as one who would take hie life. Medical Evidence. Dr. J. B. W. Roberton, of Te Awamutu, said he saw nothing inconsistent with suicide. In view of the track of the bullet he doubted whether an accident had occurred. 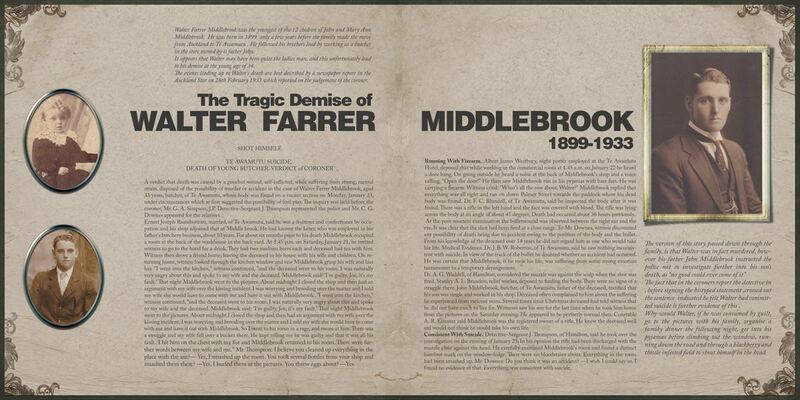 He was certain that Middlebrook, if he took his life, was suffering from some strong emotion tantamount to a temporary derangement. Dr. A. G. Waddell, of Hamilton, considered the muzzle was against the scalp when the shot was fired. Stanley A. L. Brandon, relief worker, deposed to finding the body. There were no signs of a straggle there. John Middlebrook, butcher, of Te Awamutu, father of the deceased, testified that his son was single and worked in his shop. Deceased often complained to him about the suffering he experienced from varicose veins. Several times since Christmas deceased had told witness that he did not have much to live for. Witneses saw his son for the last time when he took him home from the pictures on the Saturday evening. He appeared to be perfectly normal then. Constable A. R. Eimmer said Middlebrook was the registered owner of a rifle. He knew the deceased well ard would not think he would take his own life. Consistent With Suicide. Detective-Sergeant J. Thompson, of Hamilton, said he took over the investigation on the evening of January 23. In his opinion the rifle had been discharged with the muzzle close against the head. He carefully examined Middlebrook's room and found a distinct barefoot mark on the window-ledge. There were no bloodstains about. Everything in the room had been smashed up. Mr. Downes: Do you think it was an accident? —I wish I could say so. I found no evidence of that. Everything was consistent with suicide. The fact that in the coroners report the detective, before signing the his typed statement, crossed out the sentence indicated he felt Walter had committed suicide is further evidence of this . Why would Walter, if he was consumed by guilt, go to the pictures with his family, organise a famiky dinner the following night, get into his pyjamas before climbing out the window, running down the road and through a blackberry and thistle infested field to shoot himself in the head. In the last post I told of the possibility that all we knew about the Farrer Family prior to Benjamin may be wrong due to such a small thing as a date of death on a hand written family tree. In order to prove either way if this date of death was indeed the death of OUR John Farrer ( father of Benjamin I needed to order a copy of his will. I received a scanned copy of the will this week and within minutes it was obvious that in fact this John Farrer who died in 1817 was in fact genuinely OUR John. His Will makes interesting reading . He was a landlord and also owned property in several towns, Bretherton, Knottingly, Orchard Head, Pontefract and had leasehold shops and dwellinghouses in Pontefract. In his will he left it all except the shop and stock and tools of trade and the dwellinghouses attached to his wife Ann, who was also sole executor of the will. The shop etc was to be split between Benjamin and Joshua both of whom had carried on the same trade as their father being clock and watch makers. To his son William he left a public house known as the Wellingtons Inn . To his daughters he left a legacy of the interest to be paid on a principal sum of 400 pounds each, and on the death of his 2 daughters (Mary Ann and Catherine) the principal amounts of 400 pounds would be divided amongst their children. After the death of his wife Ann all the other property was left to Wililam, Joshua and Benjamin. John was quite specific in his wishes. Unfortunately nothing in the will indicates the maiden name of his wife Ann nor his parentage so this remains a bit of a mystery. Every Farrer tree I have found online has the same incorrect information that we previously had on ours so finding the truth may take some time. Welcome to new subscribers to our family newsletter. This newsletter now goes out to 70 separate email addresses. Considering we started with just 13 its great to see the word spreading. The reunion is fast approaching. Remember to register before the end of November for the current pricing. Thanks to the many of you who have registered already. We are looking forward to the many of you coming from Australia. In a previous newsletter we researched the origin of the middle name of Henry Cockroft Middlebrook. Henry was the youngest child of John and Ellen Middlebrook. He was just a baby when they arrived in New Zealand,so would have been the child most "at home" here, with no memory of his previous live in Yorkshire. Sadly though Henry died aged 15. For interest sake I ordered the death printout pretaining to Henrys death. He died of Phthitis which is another name for Tuberculosis, which coincidentally is the same illness that killed his father John. While we have no proof to back this up, there is a theory that John's diagnosis of Tuberculosis may have been the reason the family emigrated to New Zealand in the first place as it was often suggested that sufferers move to a better climate. If this was true then how tragic that the same disease would also kill his youngest child. WHO IS ALFRED EDWARD EVERSHED?? While researching the origin of the name of Henry Cockroft Middlebrook I discovered one of our most notable relatives. Alfred E Evershed of Launceston Tasmania, was nominated twice, in 1935 and 1937 , for a nobel peace prize, based apparently on his writing in support of peace between nations. His connection to us is complicated but in actuality for most of us he is a second cousin, 2 or 3 times removed which makes the link seem quite close indeed. To trace the connection we need to go back to John Middlebrook ( the elder) and his siblings one of whom was Elizabeth who lived quite an interesting life it seems. She married several times ( more on this later) and one of her marriages was to Henry Cockroft who was a cloth trader , and to whom she had 3 children , Ellen Middlebrook Cockroft, William Henry Middlebrook Cockroft, and Sarah Hannah Cockroft. Unfortunately Henry died when Elizabeth was pregnant with Sarah, and even more tragically her only son William died a few years later aged only 4. Elizabeth went on to remarry Thomas Sturdy, who bought up her daughters Ellen and Sarah. ( and they also had another daughter together named Elizabeth Sturdy. Ellen Middlebrook Cockroft married Frederick Evershed and they had 5 children before Frederick also unfortunately died aged only 30. Sarah married Alfred Evershed who was Frederick's brother. They took Ellen and Frederick's son Bertrand under their care and along with their other 6 children moved from their home in Sussex to Tasmania in the 1880s. Sarah and Alfreds eldest son was Alfred Edward Evershed . Alfred Edward Evershed was born on 22 Apr 1870 in Littlehampton, Sussex, England, the elder son of Alfred Evershed (1839-1912), timber merchant, and his wife Sarah Hannah Cockcroft (c.1839-1928). He came to Tasmania with his family in Jan 1885. Educated by a governess, he later attended the Launceston Technical School which his father helped to establish. Alfred received a special first award for his carved coat of arms at the Tasmanian Exhibition in 1891-92. He was the secretary of the Literary Society in 1892. By 1904 AE Evershed & Co. of 65 George Street, Launceston, were the agents for Merryweather's fire engines, hoses and equipment, ice and refrigeration machines and other items. Alfred Edward did not marry and died in Launceston on 31 May 1941 aged 71. He was buried at the Carr Villa Cemetery in Section C 224. His father and younger brother Harold are also in the Launceston Family Album. See The Examiner, 30 Dec 2006, page 31. If anyone has any spare time and can research the Evershed descendants ( of the other children of Alfred and Sarah) and let them know of our reunion it would be much appreciated. - We would welcome them ! We are still looking for further photographs to include in the Pictorial book which will be available at the reunion - please email Lauren if you have anything at all which may be of interest. This includes not just photographs from the 19th century but also 20th century photographs pertaining to the Middlebrook family. If you do not have any way of scanning the photographs we may be able to organise someone to visit . With Christmas between now and the Reunion date, and the busy season encroaching on our lives we have to set a close off date for any photos to be included in the Pictorial History books to be published for the reunion. We are excited at the number of registrations we have already received. It sounds like there will be quite a few coming from Australia and this is great to hear. Its very rewarding to think that through the reunion we are connecting so many family members together. Reunion registration details are below. The day will begin with check in where you will be issued with name tags denoting which branch of the family you belong to . This will make it easy for you to recognise those who descend from the same branch of the family as yourself. From 12 noon we will have our photographer taking formal group photos of each branch of the family and of the whole group, along with roaming candid photos throughout the day. These photographs will be available in an inexpensive book form, after the reunion. Orders to be taken on the day or beforehand via a form which will be included in a later newsletter. Leading up to the reunion we will announce the price of a photographic family history book which will be available for pre-purchase and pick up at the reunion. The book is well into production now. In order to include as many branches of the family as possible we need your input. Please send any family stories and or photos to Lauren as soon as possible. Finger food and tea and coffee will be supplied throughout the day and a cash bar will also be available for those who wish to make use of it. There will be photographic and informational displays and a large family tree available for viewing. Saturday primarily though is a mix and mingle event where we can all get to know each other. Feel free to bring along any photos or copies, along with family mementos you wish to share or display. This is at your leisure. We have suggestions for local restaurants for those interested. WHAT HAPPENED TO THE JOHNSON GIRLS? This photo above is apparently of Ruth and Joyce Johnson, daughters of Mary Lucinda Wishart (Maisie) Johnson (nee Middlebrook) . We have no descendants of Maisie registered for the reunion. Glenda born 1913 and died 1940 apparently in childbirth though I have no confirmed marriage or spouse for her. Ngaire Joyce Johnson, known as Joyce, born 1914- She married Warwick Francis Harvey and had two children that we know of, Warwick Lynton Harvey born 1937, and Jennifer Farrer Harvey born 1945. ( There could have been more children that we are unaware of). We can not find a death date for Joyce. Ruth Johnson who married Wilfred Henry Pool - we dont know of her children at this point, but we know from electoral roll records that she was living in Fearon Avenue Mt Eden in 1981 and she died in 1997. Can anyone shed any light on the whereabouts of any of Maisies descendants? From Maisies will ( in 1975) we know she left property in Auckland to Warwick Lynton Harvey who at the time lived in Tauranga, and left a house in Dillon Street Waihi to her daughter Ruth Pool. She also left property to another Granddaughter- Glenda Arawa Lindsay . Joyce and Jennifer are not mentioned in the will and I have yet to ascertain where Glenda Arawa Lindsay fits in. If anyone has further information regarding Maisies descendants we would really appreciate you contacting any of us on the committee. Mary Jane Middlebrook nee Rea was the wife of Samuel Middlebrook. We dont have many photos of her, in fact at current count we have 2 definites and one possibly! The full colourised version of the photograph shows Mary with hazel or brown eyes, and even the middle version she definitely has dark eyes but if you look at the original version its quite clear she had quite light coloured eyes ( probably blue) and certainly her hair shows the unruly curls which were passed down through several of her daughters and still is dominant in some of the current generations of descendants. Which version of the photograph do you like best? - She certainly looks more elegant and refined in the touched up versions with the shading in teh cheek, lips and eyes, but knowing her life story and her unconventional relationships, I feel more connected to the untouched version which I think shows a bit more of her true spirit. The first stage of the Middlebrook Family History Website is now up and viewable. The Stories page is regularly updated so feel free to check for new images and stories . The life of Amelia Fennell,(known as Amy), like that of her sister Ellen is shrouded in more than a little mystery. Born Amelia McRa, the eldest child of Jane Middlebrook and James John McRa, She was born apparently in Tararu Creek Thames in 1869, however as there is no registered birth for her ( nor for her sister Nellie) we only know this , as it is what is stated on her marriage certificate. Even then,it may not be factual, but it is the truth as she had been told. We know nothing of Amy’s childhood. She first appears in written family history at around age 19 in 1887, when her uncle Welsh McRa writes to Amy’s mother Jane, suggesting that her current working position with another Uncle and Aunt is possibly not working out to Amy’s best interest, and he removes her from there and returns her to her mother in Opua. (Though it isnt completely clear, it appears Amy’s sister Ellen (Nellie) may also have been with her at the time. It sems Amy stays in Opua as she appears there in the 1893, and 1896 electoral rolls as a Domestic Servant, but it isnt until the 2nd October 1902, aged around 35 that she married Patrick Fennell, in Russell Bay of Islands . It seems a strange match. Patrick, a widower, is aged 73 at the time of their marriage. A huge age gap by any standards. Amy and Patrick remain living in Opua. They went on to have two children, Nicholas John Charles Fennell (known as Charlie) born 1905 (Amy would have been 39 and Patrick 76) and seven years later George Duncan Fitzroy Fennell ( at this point Amy would have been aged 43 and Patrick a venerable 83 year old!!) Good things were not to come for the Fennell family. SHOULD CANCER PATIENTS BE RECEIVED THERE? CASE OF MR P. FENNELL. In Wednesday's "Advocate" we published some comments made by Inspector Skynner to the Bay of Islands Hospital Board.-The report dealt with the case of an old man, Mr P. Fennell, of Opua. Fennell was a cancer patient and Inspector Skynner complained that he had been driven from pillar to post. Describing the case the inspector continued:—"First he was taken to the Old Men's Home at Whangarei; thence to the Knox Home for Incurables at East Tamaki, and at the instance of the trustees of that institution back to his home a Opua. I consider it my duty to point out in the strongest language. I possibly can that I consider the whole position a most disgraceful one, and if such institutions, as the Costley Home, the Knox Home for Incurables, and the Old Men's Home at Whangarei will not provide a resting place for our''aged poor”, whose days are probably numbered through suffering from some incurable disease, I consider it is your Board's duty to suffering humanity to bring the position under the notice of the Hon. Minister for Public Health." In comment on the lack of an essential provision the "Luminary" has the following:—"There is no institution North of Auckland set apart for the care and treatment of persons suffering from incurable diseases, and the Knox Home for Incurables, in Auckland, refuses to receive patients from this district. These facts were brought out at the meeting of the Hospital Board on Friday, owing to a letter received from the house manager of the Auckland hospital asking the board what it was going to do with Mrs Fennell, a resident of Opus, Bay of'-Islands, now lying in the Auckland institution suffering from an incurable disease. It will be remembered that in 1915 Mr Fennell, of Opua, was found to be suffering from cancer. He was 84 years of age and was in a deplorable condition with the disease. The poor old man was sent to the Old Men's Home, Whangarei, which refused to keep him, so the Board sent him to the Knox Home for incurables, Tamaki, Auckland; but even there he was not allowed to rest and was packed back to Opua. The local Board then placed him in a shanty in the hospital grounds, where he soon after died. Now his wife is afflicted with the same disease, and it looks as if the poor woman is to be driven from pillar to post like her dead husband was. Amy died on May 4th 1917, and it seems the 2 boys, Charlie aged 12 and George aged just 5 were split up. George was bought up by his maternal uncle, John Roderick McRae who was a bootmaker in Paptoetoe. George went on eventually to take on the same trade. Charlie though, aged 12 went elsewhere. By 1923 he was in Awakeri, Bay of Plenty. He remained in the Bay of Plenty area for the rest of his life. My father was an Anglican clergyman for all the time I knew him and our family life was in many ways shaped by the needs of each Parish he'd been appointed to. After leaving St. John's College at Remuera, the theological training college, and being ordained, first deacon then priest, he assisted at Taumarunui, Gate Pa, Tauranga, and at St. Matthews, Masterton where he met and married my Mother (Eleanor Hope Dillon). Dad was sent as Vicar to Ormondville, a small country town and a farming and railway centre, and as WW2 loomed they set up house in a large, draughty Victorian vicarage on a hillside, with a main rail line just across the road, and began a family. In 1945 we moved to Gisborne, then Ruatoria, on the East Coast, from 1952 until 1957 when we moved to New Plymouth. Dad's last move took him back to Gisborne again where he remained until his passing on 21st Mar. 1968, just a few months before he would have retired. Dad was born in Opua on 28th Oct. 1903, to a widowed schoolteacher, Julia Sullivan, who already had five children, and her new husband, James Middlebrook, a carpenter, recently divorced and without children, who had lived some seven years in the town. He left Auckland Grammar school with a passion for drawing and design and perhaps in the early 1920's was articled to Griersons, Architects, or an associated firm, and began study at Auckland University School of Architecture. He described some of his work at the architects, who were designing the Auckland War Memorial Museum, where he prepared both full-scale drawings of the large WWI battle names to be carved into the Portland-stone frieze of the Museum and also the large watercolour drawings of the proposed façade. He had become skilled in classic Roman lettering and was able to produce tracings, for transfer to the stone, with the exact lines needed by the stonemason to cut the complex angles and curves within each letter and for it's spacing from the next. The work stands perfect to this day and in contrast to the similar WWII battle names on the later section. Other commissions he worked on included the old Auckland Power Board building near the waterfront, now gone I think, the Elephant House at the Wellington Zoo, the Wintergarden glasshouses in the Domain and others. It is interesting that his younger brother, Russell Middlebrook, made the models from which the classic oxidised-bronze wreaths and swags that ornament the Museum upper floor were cast. Those fulfilling times were not to last; the Museum had hardly been finished when the Great Depression began to bite. All public works ceased, businesses failed and work was not to be had. We think that his mother, Julia, may have had Russell, Eva, Perhaps Bart, as well as Dad, still living at home in Burch St, Mt. Albert. Her husband, James, had died in 1930 and Dad had lost his job when his employer closed the office..
Dad had experience of the Relief Work scheme offered by the Government; he told me of workers, at railway yards, moving great piles of coal or ballast metal with shovels and wheelbarrows and then moving it all back again! He saw much poverty around; single mothers with children, and without work and no means to buy food, forced to seek charity; the elderly and the disabled the same. The effect of his experiences in the early 1930's convinced him of his calling to the Ministry and his entering St. John's College. For all the years I remember, he would begin his day at about 5am, or earlier, taking tea and toast into his study. His many books, both theological and architectural, were kept there along with the large table he used for his drawing board and T-square. Sometimes he'd be working on his sermon for the coming Sunday, but mostly drawing and designing. He designed churches at Waitara, Te Puia, Makaraka, Ruatoria and a girl's college chapel, among others. Quite often he was called on, by a church somewhere, to supply a drawing for a fitting or ornament; sometimes a banner or candlesticks or pews. Many of his drawings survive and show the great skills he had. He was popular with the parishioners and spent much of the week in visiting; no one was missed either at home or in hospital. It was often mentioned to me how good a listener he was, and by others how he never brought religion into a conversation unless asked about something. Being a friend was often more help than being a Pastor. Veteran of the Maori War: one who played a full part in the pioneering settlement in New Zealand in the latter part of the last century,and a well-known and affectionately regarded identity in these parts, Mr Samuel Middlebrook,of Waihi died in the Waihi Hospital last Saturday. He was 91 years of age. Mr Middlebrook was a very versatile man, who played many important parts in the early days of Katikati. He was a brilliant Maori linguist, a great sportsman; musical and a great lover of little children. He was one of the foundation members of the Katikati Royal Orange Lodge and to the end was a most keen member. This article includes a few inaccuracies mostly based on Samuel’s age. It was commonly thought Samuel was in his 90s, but in actuality he was only 89 when he died. His birth year was 1856 not 1854 and his family arrived in New Zealand in December 1862 not 1861.